LINT FREE WIPES • "POLYSOFT WIPES"
LOOKING FOR A LINT-FREE CLOTH? INDUSTRIAL: used in critical processes within engineering and manufacturing, pharmaceutical, spray booths, food processing etc. As evident from the above examples, the applications of the POLYSOFT WIPES lint-free wipes are wide and varied for this speciality cleaning cloth. 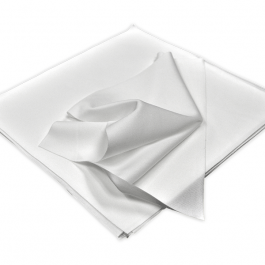 So, if your business is not already using POLYSOFT WIPES , give them a try and enjoy the many benefits of a lint-free, strong and tear resistant, highly absorbent, sterile, soft cloth available in packs of 150 cloths (22cm x 22cm). POLYSOFT WIPES are made from 100% continous polyester fibres that are double knitted and laser cut to prevent any loose fibres escaping during use. Furthermore they are also purified through multiple washes in de-ionized water, then vacuum packed in a Class 100 (ISO Class 5) cleanroom making them hygienic and safe. To ensure no damage to sensitive surfaces the wipes are extremely soft and can be used comfortably on glass, metal, skin and well as other delicate surfaces. They are made from a heavy weight material so have high absorbency (400ml/sqm) and have a high tensile strength so will not break easily. Can be used with chemicals. Soft and Non-Abrasive: The fabric is extremely soft, and can be used comfortably on glass, metal, skin and well as other sensitive surfaces. So, if you are looking for a speciality lint free cloth that is soft and non-abrasive, try the POLYSOFT WIPES for safe and sterile cleaning. Available in packs of 150 cloths (22cm x 22cm). Popular with PRINTERS, PAINTERS, CARERS, MEDICAL PROFESSIONALS, AUTOMOTIVE RESELLERS, CAR DETAILERS, RESTAURANT OWNERS, SCIENTISTS, and CRITICAL PROCESS MANUFACTURERS.